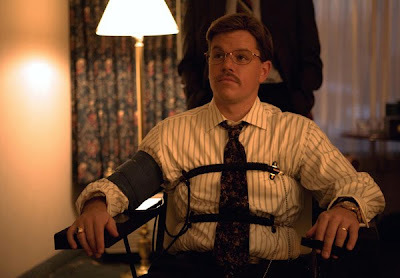 Google+ Cinema Viewfinder: Movie Review: The Informant! The cinematic trickery begins with Soderbergh's decision to shoot the film with that vaseline-on-the-lens type look that blows out white light, the typical look of those seventies suspense thrillers a la Pakula's The Parallax View (1974). Given the cinematographic staging, one would be justified in thinking this will be a film involving conspiratorial corporate intrigue in the vein of the aforementioned movie, or of Mann's The Insider (1999). Except the subject here is not Big Tobacco. It is lysine, a relatively unknown food additive. And like lysine, the film's protagonist is unremarkable yet essential to the story. Whitacre narrates the complex trifle, leading the viewer up blind alleys to dead ends as he plays whistleblower for the FBI. He implicates his employer, Archer Daniels Midland, in a lysine price-fixing scheme that involves other multinational corporations. It soon becomes apparent that Whitacre is not exactly what you'd call a reliable narrator. With every revelation he offers he withholds a vital piece of information, from his FBI contacts and the viewer alike. Marvin Hamlisch's confection of a score seems anachronistic, even for this film set in the nineties. But it is yet another indicator that there is more going on here, evocative of both seventies era cinema—Hamlisch's musical themes were ubiquitous then—but mindful of the clownish Whitacre, upon which the FBI has built their investigatory house of cards. It also signals that the film is ultimately a comedy with a cipher at its empty center. As layer of upon layer of The Informant! 's complicated plot unravels under the intense surveillance by the phalanx of attorneys, law enforcement, and corporate honchos—played by a long list of comedians (the Smothers Brothers, Scott Adsit, Tony Hale, Joel McHale, Patton Oswalt, and others; who else could keep such straight faces in the face of the ludicrous, but true, plot developments)—it is Whitacre and his motivations that prove to be the greatest mystery of all. Why do i get the sneaking suspicion that this will go down as one of the more underrated movies of the year? Loved this movie, and every little detail that Soderbergh brought to it. I'm dying to see this film. Big fan of Soderbergh and the trailers for this one looked really good. Great to see Soderbergh getting Marvin Hamlisch out of semi-retirement to score his film, as well!